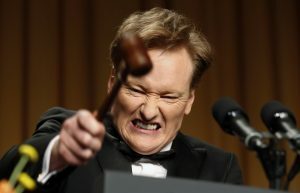 Heard the one about the writer who says talk-show host Conan O’Brien stole his schtick? It’s the latest case of creative types, from Radiohead to Oracle, refusing to share clever but derivative ideas. Excessive legal protections that stifle innovation are no laughing matter. Until recently, directors and officers could chat on individual accounts with near impunity. Now courts are forcing bosses at Uber, Facebook, Papa John's and elsewhere to cough up private and often incriminating texts. Think twice before sending that smiley-face emoticon. United Natural Foods is suing Goldman Sachs, saying the firm put its own interests first when it advised on and financed an acquisition. Goldman disagrees. Whatever the reality, having one adviser in multiple roles may be efficient, but it carries some risk of bad blood later. Ditching the Chinese supplier could push up costs for the region’s carriers, and knock 7 pct off their market value. Politicians may deem that a price worth paying to ensure the security of mobile networks. Yet slow-growing, debt-heavy telcos hardly need another cash flow hit.